My little boy isn’t the only one who needs an art project at times. We too need art: that act of putting creative energy into practice, of creating something tangible that expresses our present moment and perhaps also a bit of our longings. Last year the women’s group I am a part of undertook a ‘vision collage’ project. 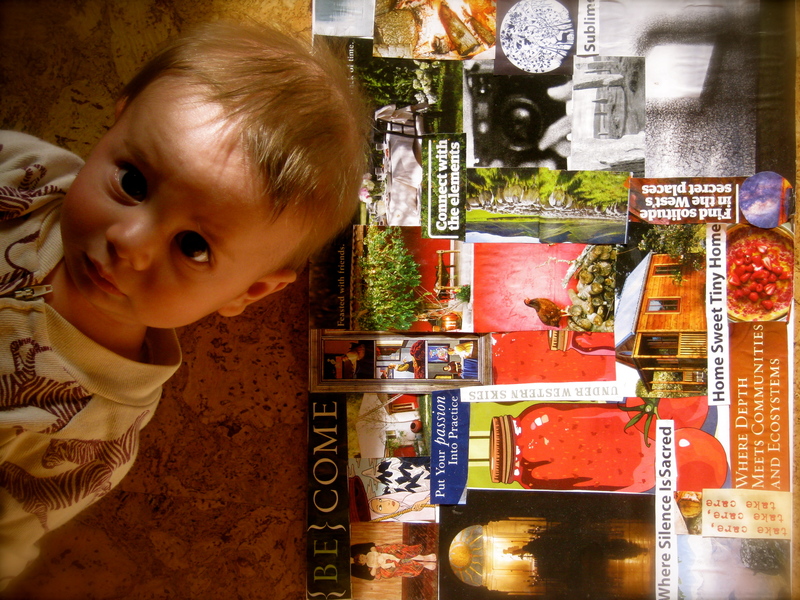 For several hours we combed through magazines and cut out what spontaneously struck us about what it is we want to cultivate more of in our lives (I highly recommend this, by the way!). All of the sudden we each were gluing an unexpected landscape onto paper and forming both a reflection of ourselves as we were in that moment as well as a blueprint for what we want to manifest further in the future. 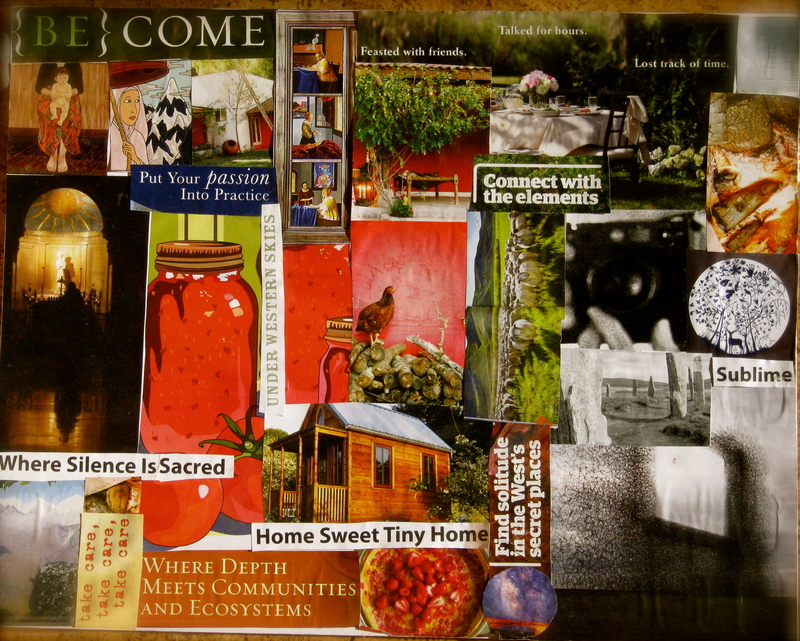 Themes that emerged in my spontaneous collage: meaningful time with community balanced with silence and solitude, spending more time outdoors, connecting with the elements, reminders of sacred earth and my love of pilgrimage, icons of motherhood and mysticism, a writer at her desk. Woven throughout is also a reflection of my desire to live more closely to the land and return to the simple joys of canning, cooking, taking care of one’s own chickens and getting my daily egg from my yard (and not 1000 miles away in Wisconsin!). Like a constant reminder, the collage rests on my kitchen counter: serving as a taut rubber band that is stretched between where I am and where I want to go. I try to strike a balance. Perhaps I’m not canning foods yet grown in my dream garden, but I am scooping flesh out of a steamed pumpkin and making homemade baby food… Like a seated forward bend in my yoga practice, I can reach towards what I want while also not pulling away from the reality and perfection of the present moment. I can keep my gaze towards my legs while also feeling the yearning to reach farther, to move forward. “How far can I stretch myself before dissolving?” It’s a recurring question for those of us who are tending from pre-dawn to pre-dawn again and again with no reprieve of sleep lasting longer than 2-4 hours at a time. I often consider what keeps me going: a determination rooted deep in my heart and gut to do what feels unabashedly right for my particular child. A profound love impulse to not turn away. A muddling through confusion – but coming out with certainty that yes, this indeed is the right response for my child. Up again, down again. Sleep on the floor. Sleep on the couch. Midnight. 2am. 5am. 5:30am. A day never ends. A day simply blurs into the next day. Given my parenting choices aren’t lending themselves to the perfect sleeping toddler (and I am not complaining, actually! ), it is entirely up to me to delineate the markers of rest and recovery for myself – because they are certainly not a given. Herein is a great lesson: We as caregivers with multiple responsibilities in life must take heed to delineate the markers of rest and recovery for ourselves. With this in mind I work to combat the inner fogginess of busy exhaustion and find the following gems feed the spirit of sanity and joy. Protect your resources. All that patience and grace and good will and love impulse: those are precious resources to be guarded with one’s life, lest we let them turn into more run-off for an even larger dead zone in the Gulf of Mexico. It’s high time to start treating ourselves as the precious resources we are. The dire nature of hitting a wall peels me out of my habitual tendencies to leech my most loving, energetic life energy. I have no choice but to regroup or dissolve. Without compassionate maintenance of our deepest intentions and inner resources rooted in spiritual practice and self-care, we begin to leech (albeit slowly, sometimes invisibly) our most precious gifts. It does one well to clarify (again and again) what it is we most want to cultivate in our lives – and then, do just that: cultivate and protect what you’ve grown with intentional care. Remember Abundance. An experience of abundance has a difficult time taking root from a place of depletion. It feels I’ll never get enough rest, no matter what I do. I get trapped in a cycle of ‘not enough this,’ ‘not enough that.’ Rather than dwelling from this place, cut back where trimming is in order. Trust the re-growth. Just like a houseplant needing to be trimmed, we can pare down and do less – remembering new growth often emerges only after we’ve cut away what needs lightening. Abundance doesn’t mean more, it often means recognizing more in less. An experience of abundance often means simply doing less. It often means shifting how we ‘get things done.’ Even in a simple breath we can experience abundance: a slow, full breath accompanied by drinking in experience with delight (rather than snatching that sigh as if you can hardly manage to get that in!). The experience of beauty is a sensitivity born from gratitude, curiosity and awe. It is a quality of one’s entire experience that can transcend the so-called ‘mundane.’ Find the inner lens that recognizes beauty and practice seeing through it, regardless of external circumstances. More importantly practice feeling through the lens of beauty. “Whatever you encounter, join it with meditation,” the Buddhist Lojong cards say. For me, the meditation is to simply remember to see and feel beauty. The beauty of this life cuts through my fog like a gentle knife cutting back overgrowth. It brings me back onto my knees, remembering my place in the divine order of life. This too shall pass – and how poignant a truth! So waste not a moment drinking in the contours of color, the sweet little hands eating juicy beets, the foggy wakeful moments in darkened rooms – a blessed chance to feel the hush of silent night and cool breeze bringing the smell of sage… What is the problem, really? Nothing! A tired fog is drenched in a beauty beyond comprehension simply waiting to be recognized.